Bleak laboratories of the Aperture Science facilities (as seen in both parts of Portal) will be forever remembered by the game’s fans thanks to the chilling soulless voices of the turrets. 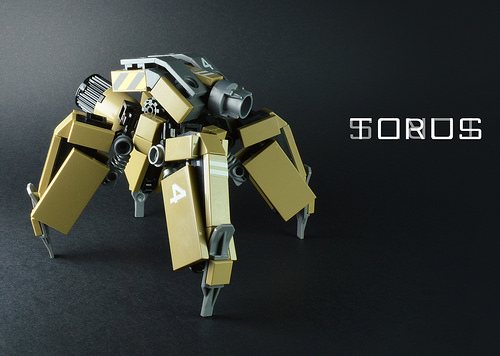 Although LEGO creations are rarely designed to make any sound effects, just pictures of these works by (FLAVIO) is enough to make me feel uneasy in much the same way those turrets did. TORUS is a beautiful example of how irregular Technic parts can be combined with tiles to create a peculiar layer of armour. 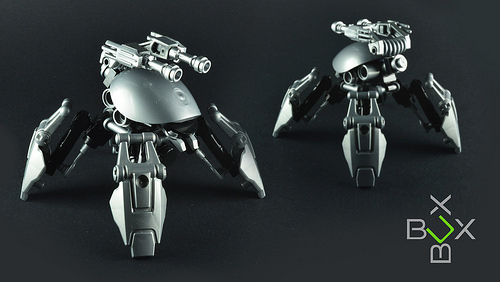 And even though turrets do not need proper eyes, a thing like this WIFFY sentinel looks particularly creepy with them. Long thin legs contribute a lot to the bot’s character (and this thing must have no character at all!). Finally, BUX looks simply invulnerable in his metallic coating. And, once again, it’s so easy to imagine its metallic voice devised to make harm even before its guns are activated.